Bowers is a psychiatric nurse, and the view he expresses is favorably coloured by this perspective, given that in his environs, it is nursing that must bear the daily brunt of most of the toil that goes with caring for such 'difficult' customers. As John Ratey at Yale has noted across time, it is this group of patients that will most test the persona and skill of any carer, and also at the same time elicit the most unprofessional behavior from even the most caring professionals. Bowers puts a lot of emphasis on a synergistic interplay between various poles of manipulative behavior, from the instrumental (objective, conscious, clear cut goals) to the interpersonal (emotional, unconscious, obscure goals) which define the parameters of manipulation. The hexagon, as he defines it, or rather the hexagonal model he provides, categorizes manipulative interactions with the patient as one or many of: Corrupting, bullying and dividing (the instrumental side), and the other three categories conditioning, capitalizing, conning (the interpersonal dimension). Bowers draws on many works in the general literature, but also heavily on the results of a survey of 651 nurses who responded to his questionnaire. This all makes for fascinating but familiar reading. Anyone from the industry would recognize the emotive and concerned responses from nurses in specialized PD units, as well as those from general wards, as they ponder their experience of those whom others consider sad, bad or mad by virtue of their interpersonal, enduring styles. Most interesting are the correlations with negative views of PD, mostly confined to those with inadequate training or understanding, and those who are just too long in the tooth in the specialized care, and have burned out or been hurt too often, or, as with so many, have just had enough. Some of the stress of course is experienced by contrasting history with presentation, wondering how someone with this presentation could have done those things. Not only manipulation, but self injurious behavior is also capable of inducing negative attribution in observers. Bowers sets about outlining an approach to inpatient management and treatment that has some aspects of many things in it, but draws on the known and desired attributes that carers have come to value, namely positive regard, structured interaction, clear boundary management, and loads and loads of training, teamwork, and the always positive person in a positive structure. Looming over the professional always is the threat of legislation and litigation, disciplinary committees and consumer groups, who may not always allow for the necessary 'dignity of risk' approach that may allow for more leeway in the field, rather than the slavish commitment to lock up someone at any hint they may die by their own hand or some misadventure: high mortality is a feature of personality disorder, and also the cycling mood disorders that some of them strongly resemble. Patients may rot without their rights, given repeated threats of self or other harm, or rot with their rights in a community program poorly funded to attend to their needs. Either way, a standard medical or psychological approach to PD seldom shows efficacy, and the need for special structure is acknowledged. 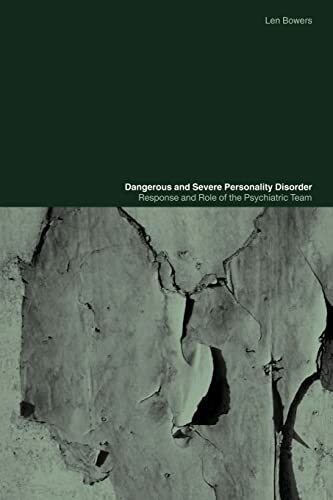 What is clear, as always in books like this, is that we need different approaches to the traditional ones, in order to protect and serve our clientele with personality disorder. The use of the nurses' comments illustrates nicely the consensus of those who work with this spectrum of disorders, and makes this book unique. It is a most helpful tome, concise and readable, useful for both entry-level professionals and also those more experienced, across the spectrum of those who need to work better within the hospital setting, anyone in fact in the multidisciplinary team, including the consumers themselves. A great strength of Bowers' approach is the reiterated stance of explaining and engaging with such clients, always telling them why. He makes no mention of the many problems they may have in processing information, but his interventions would appear to serendipitously solve such issues by the imposition of such clear communication of structure as he paints it. If the neophyte then emerges from college, and now wishes to engage with such challenging personalities, then a combination of this work, with John Ratey's neuropsychiatric tome, and Marsh Linehan's various works in Dialectic Behavior Therapy, should constitute a thorough grounding for any professional. Making life easier for 'us' and 'them' as Bowers styles his last chapter, is what it is all about.